Our mission has been linked with you for a long, long time. We have followed your progress even going back to the earlier civilisations, of which Atlantis and Lemuria are the most recent ones known to you. We have always had some influence on your evolution, but that is only to the extent that we are allowed to do so. The freewill factor has played an important part in your experiences, and we would not interfere with what you have created for that purpose. Guidance is permitted, and assistance to Mother Earth that has been more direct in recent times. The Creator decreed that Ascension would complete your cycle of duality, and we have the honour and responsibility to see you through to completion. We would remind you that unlike your previous cycle, in your present one we have had the authority to intervene in no uncertain manner. Otherwise the dark Ones would by now have destroyed the Earth, and all life upon it. This time round it is the conclusion of your experiences in duality, and is why you will soon meet your ancestors from the Inner Earth. Where your consciousness levels are concerned, you have progressed sufficiently to renew your link with them and will learn about your past history together. It will not be entirely new to you all, as contact has been made with them from time to time from those who found themselves entering the Inner Earth. The most notable ones are Admiral Byrd and Colonel Billie Faye Woodard whose experiences are well documented. Dear Ones, the truth can at times be far more extraordinary than fiction, although your fiction writers have often been inspired to reveal it to you. When you look back at Star Trek it is one such T.V. program that has consciously or otherwise prepared you for our coming. In the Galactic Federation there are numerous civilisations that are most human in appearance, but also those who are quite different. One thing they all have in common is a level of spiritual consciousness that has enabled them to join us. You must therefore meet them to experience their flowing energy of love, and any fear will be immediately evaporated as looks alone can be deceiving. We would remind you that your civilisation has been granted membership to the Galactic Federation, but that will obviously only apply to those of you who ascend and have a sufficiently high level of consciousness No one does the choosing as your readiness is quite easily discerned by us, and that often quoted Law of Attraction comes into it. We would hasten to add that all souls will eventually reach the higher level, and the time factor is of no consequence as you have all infinity to do it. The key factor is associated with what you choose to experience, and how long you desire to continue with it. Also remember at this point, that you were once Light Beings of a very high status. You were keen to experience the lower vibrations, knowing it would expand your consciousness enabling you to help others who may follow in your path. Life is just one great adventure that is never ending, as the Creator is ever dreaming into being more creations. Ahead of you lies great challenges and opportunities to serve others. 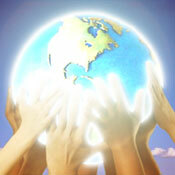 Service to self soon changes to service to all souls, and will find yourselves becoming part of a group consciousness. It is the path of natural evolution, until you finally become One with the Source of all That Is. But by your reckoning, it is a long way off and there is still a long way to travel. I am SaLuSa from Sirius, and would say without meaning to be derogatory, that the Human Civilisation has been at the level of an Infants School. That has been the result of losing your higher levels of consciousness, which happened when you dropped down through the different dimensions to where you are now. In fact you have made wonderful progress in a mere 30 years or so since the Harmonic Convergence. Be assured that you have worked hard to lift your selves up, and have succeeded. Help has always been there for you, and many souls have responded to the call and joined you on Earth. The result is that you have become true Beings of Light, and we love your determination to reach Ascension. Bless you each and every one. Mike's next message will be on Wednesday 28th. September.